Ralph Feinnes with a bust of George Bernard Shaw. 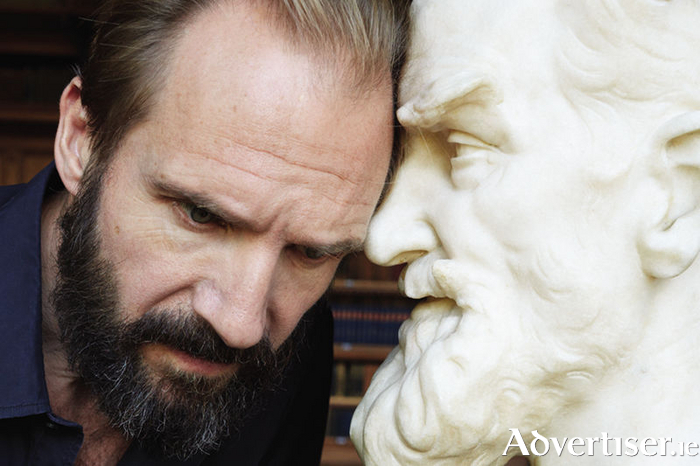 RALPH FIENNES, the Oscar nominated British actor, will play Jack Tanner in George Bernard Shaw’s witty, provocative, classic Man & Superman, which can be seen in The Eye Cinema tomorrow evening - May 14 - at 7pm. Man & Superman, which will be broadcast live to the cinema in Wellpark, from the National Theatre London, is a mixture of romantic comedy, fairytale, and fiery philosophical debate and is considered one of Shaw's greatest comedic plays. Jack Tanner, a celebrated radical thinker and rich bachelor, seems an unlikely choice as guardian to the alluring heiress, Ann, who decides that she would rather like to marry this dazzling revolutionary. Tanner, appalled by the whiff of domesticity flees to Spain, where he is captured by bandits and meets The Devil, and an extraordinary heaven versus hell debate ensues, and a showdown confrontation with Ann. For booking see www.eyecinema.ie or call 091 - 780078.